Russian author, historian, and poet; born at Bykhov, government of Moghilef (Mohilev), Russia, in 1819; died in Wilna Jan. 2, 1899. He studied Hebrew and Talmud in the ḥeder, and two years after his marriage he went to the yeshibah at Volozhin (1835). The six years spent by him in study there caused an affection of his eyes, to cure which he migrated to Wilna. There he entered the "Klaus" of Elijah Gaon for the study of Talmud. His extreme poverty forced him to divorce his wife. Soon after he left Wilna and went to Kalvariya, where he became an instructor in Hebrew and commenced the grammatical study of the Hebrew and German languages. In 1843 he returned to Wilna, where he entered the yeshibah of Rabbi Israel Ginsberg (Zaryechev), from whom he received the rabbinical diploma. Schulman's aim was to bring about a Jewish renaissance in Russia. He knew that the only language by means of which this aim might be reached was Hebrew, and that this had been neglected for centuries. He set out to resuscitate it. Schulman, in his writings, limited himself to the use of strictly Biblical terms, but so expert was he in the use of Hebrew that there was hardly any shade of thought or any modern idea that he could not easily express in that language. The result was that he came to be the most widely read Jewish author. He succeeded in creating a new epoch by implanting in the hearts of his brethren a new love for literature and science, and by showing them that they had a glorious and resplendent history, and that outside of their dark, cramped quarters in Russia there existed a beautiful world. 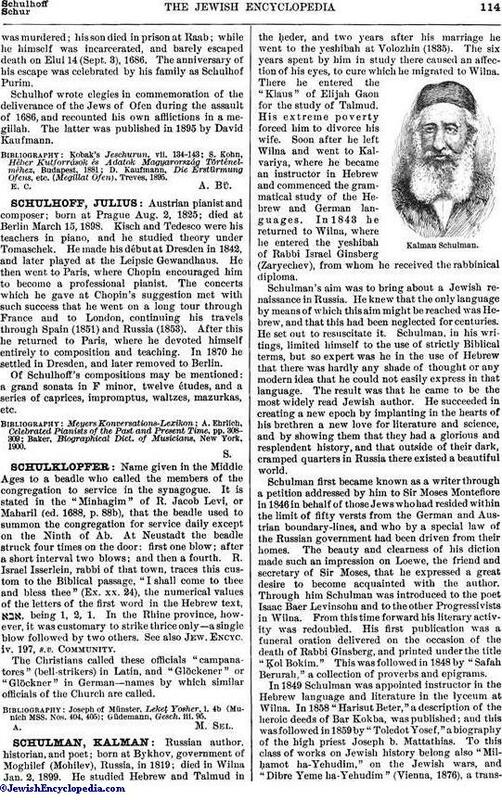 Schulman first became known as a writer through a petition addressed by him to Sir Moses Montefiore in 1846 in behalf of those Jews who had resided within the limit of fifty versts from the German and Austrian boundary-lines, and who by a special law of the Russian government had been driven from their homes. The beauty and clearness of his diction made such an impression on Loewe, the friend and secretary of Sir Moses, that he expressed a great desire to become acquainted with the author. Through him Schulman was introduced to the poet Isaac Baer Levinsohn and to the other Progressivists in Wilna. From this time forward his literary activity was redoubled. His first publication was a funeral oration delivered on the occasion of the death of Rabbi Ginsberg, and printed under the title "Ḳol Bokim." This was followed in 1848 by "Safah Berurah," a collection of proverbs and epigrams. 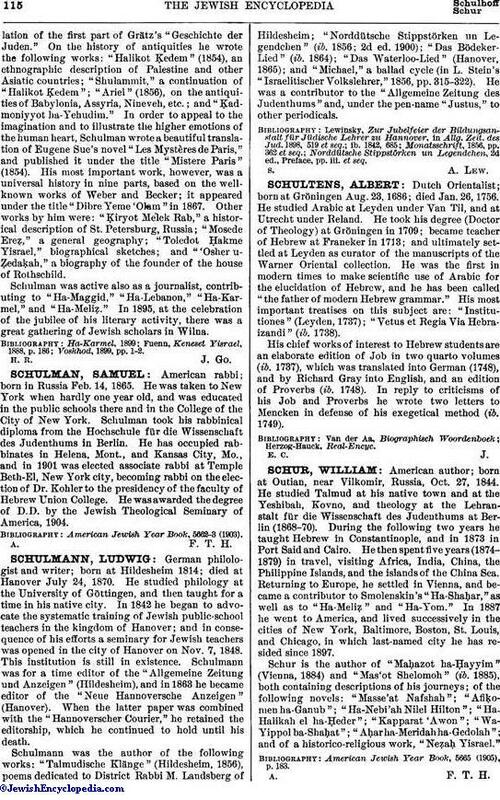 In 1849 Schulman was appointed instructor in tile Hebrew language and literature in the lyceum at Wilna. In 1858 "Harisut Beter," a description of the heroic deeds of Bar Kokba, was published; and this was followed in 1859 by "Toledot Yosef," a biography of the high priest Joseph b. Mattathias. To this class of works on Jewish history belong also "Milḥamot ha-Yehudim," on the Jewish wars, and "Dibre Yeme ha-Yehudim" (Vienna, 1876), a translationof the first part of Grätz's "Geschichte der Juden." On the history of antiquities he wrote the following works: "Halikot Ḳedem" (1854), an ethnographic description of Palestine and other Asiatic countries; "Shulammit," a continuation of "Halikot Ḳedem"; "Ariel" (1856), on the antiquities of Babylonia, Assyria, Nineveh, etc. ; and "Ḳadmoniyyot ha-Yehudim." In order to appeal to the imagination and to illustrate the higher emotions of the human heart, Schulman wrote a beautiful translation of Eugene Sue's novel "Les Mystères de Paris," and published it under the title "Mistere Paris" (1854). His most important work, however, was a universal history in nine parts, based on the well-known works of Weber and Becker; it appeared under the title "Dibre Yeme 'Olam" in 1867. Other works by him were: "Ḳiryot Melek Rab," a historical description of St. Petersburg, Russia; "Mosede Ereẓ," a general geography; "Toledot Ḥakme Yisrael," biographical sketches; and "'Osher u-Ẓedaḳah," a biography of the founder of the house of Rothschild. Schulman was active also as a journalist, contributing to "Ha-Maggid," "Ha-Lebanon," "Ha-Karmel," and "Ha-Meliẓ." In 1895, at the celebration of the jubilee of his literary activity, there was a great gathering of Jewish scholars in Wilna.